Race results will no longer be compiled and read out after our runs, but the first 3 in each event will be noted in the web results. Compiling these results ties up a helper, and the read-out is not necessary as results are on the website the same day. New course for Darlington Dash agreed, starting at Glenn Forest. Agreed to purchase a second recording watch. For GOT run, we will all meet at the Hockey Club where there are toilets and we will have the greeting. Then walk over to the start in Bold Park. Andrew continues to pursue our ‘green’ agenda and has purchased more recyclable paper cups. But we also request that you bring and refill your own water bottle to avoid using the cups at all at the finish. The track handicap at UWA is set for May 9th, and there is no ECAC meet that evening. See previous post on entry details. Ernie Leseberg has agree to be our new webmaster. Many thanks to Hamish for the great work he has done on the website over the years. Colin Smith is working on the design of a MAWA running cap. The AMA Half Marathon will be in Perth May/June 2020. Jim Langford will lead the team that will plan this event. Our onepiece uniform has been approved, and a compression top sample is being produced. Contact Mark Howard if interested. Due to high visitor numbers at our events a committee member will be available to assist Andrew at the visitors table. The Darlington Dash will now start at Glen Forest and go towards Darlington and back. This is primarily for safety reasons to avoid road crossings. The new course will be 5.5km and 11km. Due to high entry numbers we expect to make a surplus on the State Champs. The committee have approved purchase of a second windgauge and a lapcounter/bell. Some changes are being made on how we show State Records. The State Record is the best performance in the State regardless of whether the athlete is a member of MAWA. Where the State record holder was not a MAWA member at the time of setting the record, the MAWA records list will also show in italics the best performance by a MAWA member, and that will be a MAWA club record. The vast majority of State Records were set by MAWA club members. A new GOT course has now been agreed with the Kings Park Board. The long run will be 8.4km. Confirmed that singlet or crop top is the state uniform, and not a T shirt. However, for athletes wanting to wear a T shirt for warmth or comfort, a plain T shirt can be worn beneath the singlet. Bookings for the March camp have now closed. The prototype one-piece uniform is due to be delivered soon. The supplier has been asked to produce a sample compression top to the same design. The plan is that both of these will become approved uniform, but we will order them directly from the supply when needed, (i.e. we will not carry a stock). We have listened to member suggestions and are making an effort to consider the environment. The Club is phasing out plastic drinking cups and replacing them with paper cups. We are also replacing existing rubbish bags with plastic bags that are biodegradable. Work continues to develop the idea of a MAWA storeroom/clubroom at ECAC that was discussed at the AGM. The effort is focusing on a modular building that could be readily moved if Canning Council moved the track location in the future. Membership fees will remain the same, except that the supplement for posted vetrun will increase to $20. A special $20 membership will apply to new and rejoining members joining for the remainder of 2018. Bold Park run very successful. Some issues identified, and a report by Paul Hughes on recommended changes has been passed to Giovanni. 2019 State Champs programme agreed, and now on website. Agreed to ask David Carr to be our new Patron. He subsequently agreed. Clash checking of the draft 2019 Sunday programme is complete. The programme will be on the website in November. MAWA will support the AMA proposal that Heavy Weight weights should vary with competitor age. Worked to prepare for the upcoming MAWA and AMA AGM’s. Membership at 625 is a new record for the club. Apologies for missing the last 2 months, due to being busy with Nationals and then being away recovering from being busy with Nationals. Following further discussions with the Council, details for the new Bold Park 2.9/5.4/7.9k event are firming up. The results tag system is performing well, and now being used without the manual back-up. The Nationals in April went very well. Thanks to VenuesWest sponsorship, the bumper entry, and excellence cost management by the committee, a substantial surplus will flow to MAWA. Precise details can be seen by members when the MAWA accounts are published ahead of the AGM. 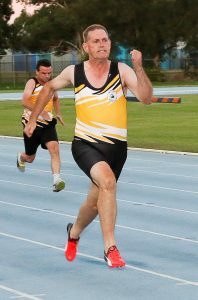 The UWA 10k track handicap will continue. A new race director is needed. The Short RWC/RRC will continue, but now on exactly the same Sundays as the full RWC/RRC. Participation in the short event would have been higher if Deepwater Point had been avoided, as this always clashes with HBF Run for a Reason. Athletes pushing strollers will be allowed at Sunday runs. They are requested to start at the back of the field. New throws equipment has been purchased. The committee approved the purchase of a set of 8 starting blocks plus trolley for ECAC. A photofinish package has now been purchased, using funds from the Perth 2016 trust. It will be used for State Champs at ECAC, and we also plan to use it for our regular Thursday track meets in the summer season. Any member who would like to be trained in its use should contact Richard Blurton. For active members, helping at Sunday runs or at T & F is a requirement of membership. With our high membership we now have a large number of members on a reserves list, and these people must be prepared to fill gaps when requested by helpers coordinator Jim Langford. Membership continues to rise and has now passed 600. We have just been advised that we cannot hold our Aquinas run due to construction works at the school. An alternative has been found at Curtin. Details will be on the website and an email sent to members. We will cancel our Paypal account. It has only been used once since 2014. With the Australian and World Championships forthcoming, there will be track and field competition at WAAS this winter as follows: 3rd/10th/17th April plus all Tuesdays in August. The club has applied for a grant from Canning Council to purchase new track and field equipment. After close of the renewal period, the club had 520 members. After many years as Race Directors, Jeff and Dorothy Whittam will be retiring at the end of 2017. We have decided that from 2019, the Track Handicap will be held at ECAC. The new Bold Park run is a very challenging 3k course, so we will just be offering 1 or 2 lap options for the 2 GOT trophies. Yet to decide whether walkers will have a separate course in Perry Lakes. The club will be applying to host the 2020 AMA Half Marathon Championship, which would be held in May. MAWA nominees for AMA Awards have been submitted. The new automated results project has been approved by the Perth 2016 Trust Fund Board. The new system will be implemented starting in February and will require all Sunday Runners to wear small tags which will be scanned at the finish. The system will improve accuracy and reduce the time spent by the Results Team in compiling results. Melville Council have agreed to sponsor all the Melville Runs. A new Coaching Grant has been received from AMA, and agreement reached with our MAWA coaches to continue their programmes through to the end of the season. Membership fee is $50. Country members $10 less.